The name means ‘Saxon’s Hollow’. A Neolithic chambered tomb formerly stood in a field near here, called “Parc-y-gromlech”. On 13th July 1614 Thomas Lloyd occupied the house here, which was probably a Tudor building. In 1615 Thomas William Lloyd, yeoman, lived here. In 1619 Pantsaeson was referred to in the Will of John Rowlands. In 1670 William Rowland was assessed at two hearths here for the hearth tax. On 6th June 1687 William Rowland wrote his will, referring to his son – John Rowland. On 6th July 1708 Thomas Rowland received certain properties in St. Dogmaels from John Rowland of that parish. On 28th February 1722 William James married Mary Rowland of Pantsaeson and took up residence. On 15th September 1723 Thomas Rowland of Pantsaeson wrote his will, referring to his eldest daughter, Mary James – wife of William James, and his youngest daughter – Anne. Probate was made in 1727. In 1752 the estate farmhouse was built and dated for William & Mary James. Outbuildings were erected in 1764. In 1766 William James was the owner. On 11th June 1769 a number of local men were accused of breaking into a close belonging to William James, treading down the grass and driving away his cattle. William Lloyd, gent, one of the accused, was also said to have broken down a gate and gate-post. On 23rd February 1774 William James of Pantsaeson became a burgess of Cardigan. On 18th March 1774 Thomas James of Pantsaeson became a burgess of Cardigan. 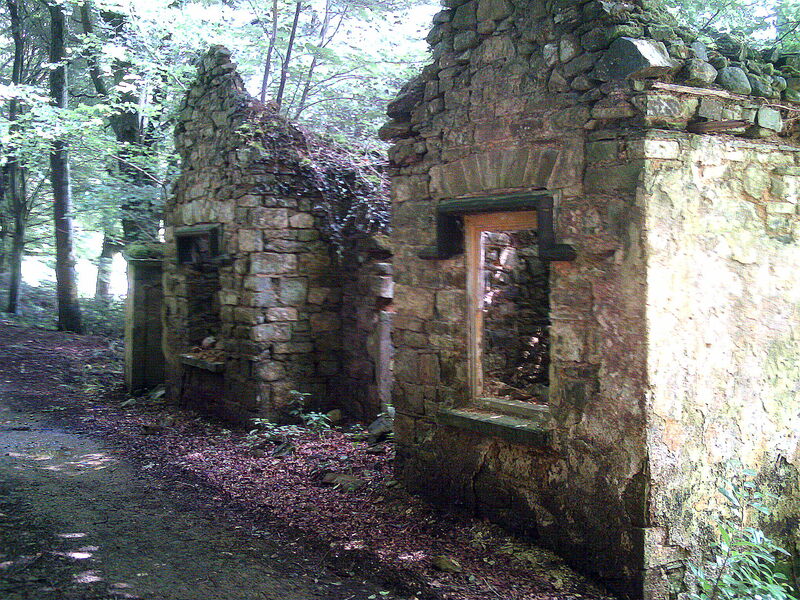 In 1779 a coach-house and stables were built for William & Margaret James. Reference was made on 18th June 1784 to William James of Narberth, eldest son and heir to William James of Pantsaeson by Margaret James, his wife. On 9th April 1787 Thomas James of Pantsaeson was accused of assault at Moylegrove by William James and was made to pay a small fine. On 10th December 1789 Thomas James lived here. In 1797-1802 William James was the owner and occupier. In 1799 Col. John James of Pantsaeson fought a duel, on the field called “Fortune’s Frolic”, either on the estate or at Haverfordwest, and killed his opponent, Samuel Simmons Fortune, and had to flee to the continent. Samuel Simons Fortune died of his wounds, leading the coroner to pass a verdict of wilful murder. The act must later have been pardoned, as John James returned years later and became a Colonel in the Pembrokeshire militia. On 10th September 1800 William James of Pantsaeson wrote his will. He referred to his late wife Margaret James; his son Rev. John James; son Thomas James; and younger children not named. On 22nd December 1800 reference was made to Thomas James of Pantsaeson. On 19th April 1803 probate was granted on the will of William James of Pantsaeson. John James and Thomas James were the owners and Thomas James was the occupier of Pantsaeson. On 21st October 1809 Thomas James, son of Thomas James, of Pantsaeson, wrote his will. On 22nd May 1810 Thomas James of Pantsaeson held shares in the ship ‘Denio’ of Cardigan. On 31st October 1812 John Taubman William James was born here. In 1812-86 John Taubman William James lived here. On 6th October 1812 John James of Pantsaeson became a burgess of Cardigan. On 19th June 1814 Dorothy Elizabeth Bateman James was born here to Mr. & Mrs. John James. In 1817 Benjamin James lived here. On 26th May 1818 John Taubman William James, son of John James & Margaret Christina Taubman James of Pantsaeson, was baptised at Monington Church, together with his sister – Dorothy Elizabeth Bateman James. In 1819 Col. John James died aged 37 and was buried at Monington Church on 4th June 1819. On 3rd October 1819 Mark Wilks William James, son of John & Margaret C. T. James of Pantsaeson, was baptised at Monington Church. In 1820 probate was made of the will of John James of Pantsaeson. On 28th May 1822 William Henry David rented Pantsaeson from the executors of the late Mr. James for 11 years at £224 per annum. On 6th June 1822 Elizabeth Neil Davis, daughter of Mary & William Henry Davis, was baptised at St. Mary’s Church, Cardigan. On 18th October 1823 Frances Davis, daughter of Mary & William H. Davis, was baptised at St. Mary’s Church, Cardigan. On 15th August 1825 Margaret Davis, daughter of Mary & William H. Davis, was baptised at St. Mary’s Church, Cardigan. On 1st May 1829 William Henry Thomas Davis, son of Mary & William H. Davis, was baptised at St. Mary’s Church, Cardigan. On 3rd May 1833 Elizabeth Jones wrote her will, indicating that she was living here at that time. She referred to her daughter Letitia Davies; grandson Griffith John Jenkins; grandson Richard David Jenkins – a minor; grand-daughter Elizabeth Mary Jenkins; grand-daughter Ann Jenkins; grand-daughter May Jenkins; grandson Thomas Davies; grand-daughter Elizabeth Davies; grandson John Davies; and daughter Ann Jenkins. On 6th May 1834 the estate was advertised for sale. In 1836 work began on a new mansion called “Plas Pantsaeson” for John Taubman William James, probably to designs by William Owen of Haverfordwest. In 1838 J. T. W. James held 280 acres here. No outbuildings are indicated on the tithe map. On 16th May 1838 Mrs. Margaret James of Pantsaeson was buried at Monington Church, having died aged 60. On 9th August 1839 William Parry James, son of J. T. W. James and Margaret Elizabeth James of Pantsaeson, was baptised at Monington Church. On 28th April 1841 John Alexander James, son of the same couple, was baptised at the same place. In 1841 the following persons lived here: John Taubman William James, 28; Margaret Elizabeth James, his wife, 28; William Parry James, 1, their son; John Alexander James, 4 months, son; E E Jones Parry; Servants – James Davies, 20; Joseph Morgan, 25; Mary Roberts, 40; Esther Phillips, 30; Elizabeth Griffith, 25; James Llewelyn, 50, cabinet-maker; Thomas Rogers, 15, cabinet-maker; and Caroline Evans, 15. The Outhouse was the home of Benjamin James, 65; Frances James, 65; and Mary Thomas, 20. Garden House was occupied by David Davies, 25, gardener; Anne Davies, 25; Elizabeth Davies, daughter; Mary Davies, 2; and Thomas Davies, 1. On 7th September 1843 Dora Emily James and Margaret Ellen James, daughters of Mr. & Mrs. J. T. W. James of Pantsaeson, were baptised at Monington Church. On 30th November 1844 their brother, Robert Lloyd James, was baptised at the same place. On 15th April 1845 John, illegitimate son of servant John Davies of Pantsaeson and Elizabeth Owens of Bridge End, was baptised by the Vicar of St. Dogmaels. 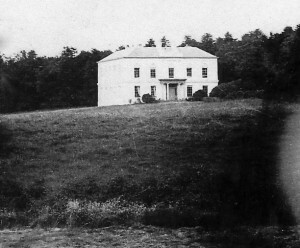 In 1851 the following persons lived at Plas Pantsaeson: John Taubman William James, 35; Margaret Elizabeth James, his wife, 35; Dora Emily James, 7, their daughter; Margaret Ellen James, 7, daughter; and Robert Lloyd James, 6, son; with 7 servants – William Morgan, 24, stable servant; David John, 15, errand boy; Sarah Thomas, 58, cook; Margaret Jones, 29, upper nurse; Mary Davis, 19, house maid; Sarah Thomas, 21, dairy maid; and Ann Fletcher, 13, under-nurse. In 1851 probate was made of the will of Benjamin James of Pantsaeson Lodge, town bailiff. He left his estate to his widow, Frances (“Fanny”) James. In January 1859 William Parry James was buried at Monington Church, having died aged 19. J. T. W. James assisted in organising the visit to Cardigan in August 1859 of the Cambrian Archaeological Association. In 1861 the following persons lived here: Plas Pantsaeson: John Taubman William James, 48; Margaretta Elizabeth James, 48, his wife; Dora Emily James, 17, their daughter; Margaret Ellen James, 17, daughter; Georgina Jones Percy, 37, sister-in-law, fund-holder; Sidney Jones Percy, 31, brother-in-law, Captain of the Madras Fusiliers; Jane Allen, 62, governess; James Moore, 21, servant; Elizabeth Day, 20, housemaid; Anne Jones, 30, housemaid; and Anne Jones, 37, dairy-maid. Pantsaeson Lodge: Mary James, 37, charwoman, widow; Margaret James, 15, her daughter; John James, 13, her son; and Hannah James, 7, her daughter. Pantsaeson Garden Cottage: John Davies, 31, gardener; and Elizabeth Davies, 41, his wife. On 29th November 1878 Mr. James held a timber sale here. On 15th February 1881 Miss Hannah Davies, 24, housemaid, married Charles Ladd of Trewidwal, St. Dogmaels. In 1881 the following persons lived here: Plas Pantsaeson: John Taubman William James, 68; Margaret Elizabeth James, 68, his wife; Margaret Ellen James, 37, their daughter; William Frederick Lloyd James, 7, their grandson; Mary Elen James, 6, grand-daughter; Margaret ?Collingwood?, 29, cousin; Mary Hannah Smith, 17, governess; Benjamin Peregrine, 37, butler; Enoch Rees, 28, coachman; Ann Williams, 22, cook; Francess Jones, 19, housemaid; and Francess Elizabeth Marshall, 24, dairy maid; Garden House: David James, 56, gardener; Mary James, 61, his wife; and William James, 14, their son; Ty’riet: William Morgan, 33, labourer; Margaret Morgan, 32, his wife; William Morgan, 9, their son; Anne Morgan, 4, daughter; and Hannah Morgan, 4 months, daughter; Pantsaeson Lodge: Mary James, 37, widow, lodge keeper; and Hannah James, 27, her daughter, house servant. On 23rd December 1881 Margaret Elizabeth James, wife of J. T. W. James, died aged 68. She was buried at Monington Church a week later. On 7th May 1883 Enoch Rees, coachman, married Elizabeth Marchant, both were servants here. In October 1883 William Morgan lived at Ty’riet, with his children William James Morgan (b. May 1872), Anne Morgan (b. November 1876) and David Morgan (b. 18th June 1879). J T W James was a Guardian of the Poor in 1885. On 31st March 1886 John Taubman William James was buried at Monington Church having died aged 73. On 2nd December 1886 Robert Lloyd James of Pantsaeson was buried at Monington Church, having died aged 42. On 17th December 1886 there was a sale of effects here. There was a sale of timber here on 11th November 1887. In the late 1880’s Mr. D. James and his wife, Margaret James, lived in the gardener’s house. Benjamin Peregrine and William Morgan also lived here. In 1891 the following persons lived here: Mansion: Sarah George, 44, widow, house-keeper; John George, 18, her son; Hannah Mary George, 14, her daughter; Tom Claude George, 12, son; and Frederick George, 9, son. Lodge: Mary James, 68, widow; and Mary Jane James, 19, her grand-daughter; Farm: William Saunders Davies, 35, farmer; Margaret Davies, 35, his wife; Beatrice Matilda Davies, 4, their daughter; Leah Mary Davies, 3, daughter; Elizabeth James, 52, domestic servant; Ellen Price, 22, servant; and William George, 15, farm servant. On 28th July 1894 William Frederick Lloyd James, son of the late Robert Lloyd James, heir to Plas Pantsaeson, came of age. In 1897 Mary Thomas, 75, of the lodge, received relief from the Cardigan Union due to her old age. Mr. & Miss Lloyd James and John Johns (farm) lived here in 1898. On 24th March 1899 William Frederick Lloyd James had to shoot dead a raging bull here. On 21st September 1905 and September 1912 part of the estate, including the farms of Bryncws and Foxhill, St. Dogmaels, was sold off. In February 1909 Captain Hulse lived here. In August 1912 the 116 acre Pantsaeson Farm was offered to let. On 9th June 1913 Anthony Bryn James, only son of Mr. W. F. L. James, died aged 2 of meningitis. In 1915 William Frederick Lloyd James was still the owner. On 9th December 1915 Mary James of Pantsaeson Lodge died aged 93. In 1926 the house was described as ‘…a handsome mansion in the Italian style…’ Reference was made to an earthwork nearby named ‘Castell-ion’. In 1934 Mrs Robertson-Williams and Ioan Williams lived here. On February 23rd 1940 James Lewis of the Garden Cottage was buried at St. Dogmaes having died on 19th February 1940 aged 54. At about that time a bomb-shelter was dug near the mansion. In 1941 Ioan P. B. Robertson-Williams lived here. In 1944 Gwilym Davies lived at the farm. On 12th January 1945 Brychan Frederick George Robertson-Williams of the Plas, died aged 75. In January 1947 Mrs Jerry Williams, dress-maker, lived in Ty’r Ardd. On 5th February 1947 Jennifer Nest Robertson-Williams was buried at Monington Church, having died aged 1 month. In 1949-53 Gwilym Davies lived at the farm. In July 1949 Gwilym Davies became a Deacon of Blaenywaun Baptist Chapel, St. Dogmaels. In 1950-55 Ioan Robertson-Williams, solicitor, lived at the Plas. On 28th October 1950 Miss Alice Matilda (“Mallt”) Williams of Plas Pantsaeson died aged 83. On 2nd February 1952 Hylda Marguerite Robertson-Williams, widow of Brychan Frederick George Robertson-Williams of the Plas, died aged 72. In 1953 J. Robertson-Williams, solicitor, lived at the Plas. In 1955 Daniel L Pope lived in Ty’r Ardd. On 20th April 1962 Pantsaeson Farm was advertised for sale with a 6-bedroom house and 124 acres. On 27th October 1965 there was a clear-out sale held here. In 2011 Pantsaeson Farm was advertised for sale. “…PLAS PANTSAESON – Circa 1836 country house, said to have been built for J T W James possibly by William Owen of Haverfordwest. [There are design similarities to Avallenau House, Pembrokeshire, and some similarities to Scolton Manor]. Stucco classical style with slate hipped roofs, extensive and plainer rear parts probably of later date. Main front has two-storey five-window elevation with pair of rendered ridge stacks. Heavy plain first floor stepped band and moulded eaves cornice. Windows are 12-pane sashes, plain below, with pediments on console brackets above, the pediments possibly a later addition. Centre is broken forward with blocking course over cornice and centre shield between scroll supporters. Paired Ionic pilasters each side of first floor window and ground floor broad double doors with sidelights and big small-paned overlight. Door is within fine projecting Doric porch with triglyph and mutule cornice and paired Roman Doric columns to front, single pilaster responds within. Slate steps up. Plain five-window W side elevation, unpainted render with band and first floor pediments as on main front, and then a three-window N front is similar. The three ranges enclose a narrow service court with tall arched stair-light to one side. INTERIOR – Centralised plan with broad spine hall, then elliptical arch to stair hall set to rear right, stone flagged with two-flight stone curved cantilever staircase and stick balusters. 6-panel doors and plaster cornices to main rooms. PANTSAESON FARMHOUSE – C18 and C19 estate farmhouse in rubble stone, roughcast to front, with asbestos roof, stone ridge stack and E end stack to rear wing. Two-storey four-window front with long 9-pane sashes above and long 12-pane sashes below, except French window in right end opening. Roof is hipped at NW angle. House was divided and given two arched stair lights, the one in main rear wall to left has been removed and reinstated in N front of rear wing, where an arch in adjoining stonework indicates position of a previous stair light. Wing has 9-pane sash each side of stair light, off-centre door below with 12-pane sash to left and 16-pane window to right. Windows mostly renewed. Rear of wing is outshut. In front wall, next to second ground floor window is small plaque ‘WIM 1752’ for W. and M. James, that is probably reset from an earlier building; this may indicate C18 origins for a building which in character is otherwise earlier C19. COACH-HOUSE AND STABLE – Dated 1779, coach-house and stable built for W. and M. James of Pantsaeson. Blue lias squared stone with asbestos and corrugated iron roof. Single-storey seven-bay front with three central camber-headed coach entries, recessed voussoirs and flush keystones, the centre arch slightly higher and with pedimental gable above pierced by single circular opening. 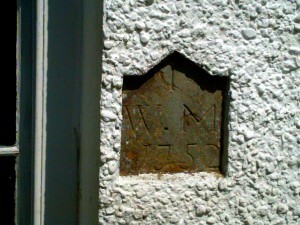 Centre plaque ‘WJM 1779’. Left coach entry is blocked. Flanking centre bays are outer stable door and window, similar each side, with cambered heads, voussoirs and keystones. Outside stairs at W end to loft door, two arched recesses under stairs. 8-bay loft roof with pegged collar trusses. Lean-to rear. OUTSIDE KITCHEN AT PANTSAESON FARM – C19 outside kitchen in rubble stone with slate roof and red brick end stack. Single storey small building with gable-end door and window with cambered brick heads and N side similar window. INTERIOR – Timber lintel fireplace within and smoke-blackened roof. BARN AT PANTSAESON FARM – Late C18 or early C19 barn in rubble stone with corrugated iron roof. Small door with cambered stone-voussoir head to right on S side, and matching door on opposite N side. N side has row of dove holes over door and two vent loops to right. E end has lean-to cart-shed, projecting out to N and dove holes in E end gable. S side has lean-to addition. INTERIOR – 7-bay pegged collar-truss roof. TWO RANGES OF LINKED OUTBUILDINGS AT PANTSAESON FARM – C18, possibly rebuilt c1830-40. Two long ranges of stables and stalls linked by archway at SW angle. Rubble stone with slate, asbestos or corrugated iron to roofs. South range has 1764 date and has six doors with cut stone voussoirs to cambered heads and keystones and six small windows interspersed between, except between two centre doors, all with similar stone heads. Paired stone dove-holes under eaves. Rear loops and E end cart-entry with cambered stone arch. At W end, attached without structural division, is gabled archway with ball finial and elliptical-arched head matching openings of W range. Very informative, a welcome insight into my families past. Thank you for your efforts. Thank you for gathering so much wonderful information together. I am descended from Rev Mark Wilks William James. I have an old photo of the house passed down through the generations. I was excited to find the house when in UK in 1987. Thank you for this article. it helped me a great deal to learn of my 7th Great Grandfather and his children. I hope I visit the property to experience for myself where my family lived, prayed and toiled. Very interesting, would love to know if there is any history known on ‘Cilgarthen’, other side of the stream to Ty Ardd ( Garden Cottage). Haven’t managed to find anything! We were once told it was where the shepherd lived? Will Morgan? Hello there! Here are my working notes on Cilgarthen. In 1670 William Rowland was assessed at three hearths for the hearth tax – perhaps for this property. His daughter, Mary Rowland, married John Morgan of Rhydgarnwen, Llantood. Nicholas Rowlands was assessed at two hearths. It was recorded again in 1695. In August 1708 William Rowland and his son, Nicholas Rowland (by his late wife, Deborah Rowland), purchased Gwayn Segyr in the parish. In 1710 they leased two quarrels of land there to David James and on 29th June 1713 leased that property to Richard Thomas of Parcypratt. On 24th March 1736, in his will, William Rowland mentions his sons – Jenkin John Rowland and William Rowland, and his brother, Nicholas Rowland. On 12th June 1756 Nicholas Rowland and James Rowland leased Waunsegyr to George Richard. On 30th April 1763 Nicholas Rowland and James Rowlands sold Waunsegyr to James Morris of Parcypratt for £120. In 1786-97 William Rowland was the owner and John David Jenkins was the tenant. In 1787 John David Jenkin became a warden of St. Thomas’ Church. In 1801-02 Anne David Jenkin was the tenant. In 1803 David John and David Jenkin were the tenants. In 1816 John Philip of Kilgarthen was a collector of the Land Tax. In 1817 John Phillips of Kilgarthen became a warden of St. Thomas’ Church. In 1828 John Phillips still lived here. In 1841 the following persons lived here: James Edwards, aged 20; Anne Edwards, aged 20; David Edwards, aged 5 months; and Elizabeth Baron, aged 15, a servant. In 1850 Thomas Davies lived here. In 1851 the following persons lived at three houses here: 1): Benjamin George, aged 35, a labourer; Frances George, aged 43, his wife; Mary George, aged 13, their daughter; Levi George, aged 12, their son; Evan George, aged 8, their son; Martha George, aged 6, their daughter; Rachel George, aged 4, their daughter; Eliza George, aged 1, their daughter; 2): Mary Davies, aged 44; John Davies, aged 6, her son; 3): George James, aged 70, a labourer; Margaret James, aged 71, his wife; Lea James, aged 23, their daughter; Ann James, aged 16, their daughter; Eliza James, aged 6, their daughter; John James, aged 3, their grandson; and William Harries, aged 2, their grandson. Cilgarthen is shown on the 1907 and later O. S. maps. O S Map 1907 etc. Glen-I have been trying to find more information on my Grandfather Thomas James. All I have is that he lived there on 10 December 1789. where can I find information earlier than 1789? I was told that there were many generations of James’ at Pantsaeson. It is my understanding that Thomas’ Grandson lived at Llawhadin. Please do not publish photos of Plas Pantsaeson without permission. And whilst it is interesting for us and others to read the history perhaps you could have been kind enough to contact us first , this is a private house. Miss Winsor. The only photograph I have published of the Plas was taken in the 1890′s, and therefore before your family purchased it. Similarly the history of any property is in public domain, though in deference to your comments, I have removed all reference to the property from the time of its’ purchase by your family. The description is available elsewhere from a number of sources, such as CADW and the Royal Commission on Ancient and Historic Monuments (Wales), and so I have retained it here. I apologise for any offence caused. Thank you Glen for this very interesting history of our property (Pantsaeson Farm). As you are probably aware, we have undergone a huge programme of sympathetic refurbishment of the farmhouse, coach house and threshing barn over the past two years. The outbuildings were in danger of collapse but have now been stabilised rather than developed. If you would like to visit to view the building, you would be most welcome and it would be interesting to speak with you about the history too. Thanks Mel – it’d be interesting to see the buildings looking tidier, and safer, than the last time I saw them! E-mail me soon and we can arrange a visit !